Venice Canal II tapestry shows a beautiful scene from Venice with gondolas in the water. A beautiful bridge is connecting the islands and is brilliantly illuminated by the sunlight. The play of light is beautiful in this work and adds much joy as it is accompanied by joyful colors. Rich brick colored walls, greens, and blue awnings provide a well balanced palette. And with certain areas in light and some in shade, this work is a beautiful work. 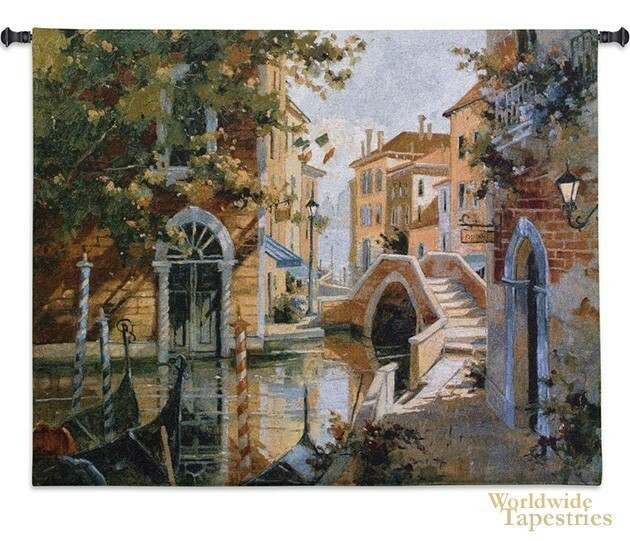 This Venice Canal II tapestry is backed with lining and tunnel for easy hanging. Note: tapestry rod and tassels, where pictured, are not included in the price.